You are at:Home»About Plants & Flowers»What are Climbing Plant? Climbing plants are plants which climb up trees and other tall objects. Many of them are vines whose stems twine round trees and branches. There are quite a number of other methods of climbing. The climbing habit has evolved many times. In most cases the climbing plants were more diverse (had more species) than their non–climbing sister groups. It is a key innovation which has been very successful. Over 130 plant families include climbers. Vine species may represent more than 40% of species diversity in tropical forests. 1. Bines, which twine their stems around a support. Many bines have rough stems or downward-pointing bristles to aid their grip. 2. Vines which use tendrils, suckers and other methods. By clinging roots (e.g., Ivy, Hedera species). The Climbing Fetterbush (Pieris phillyreifolia) has a strange habit. 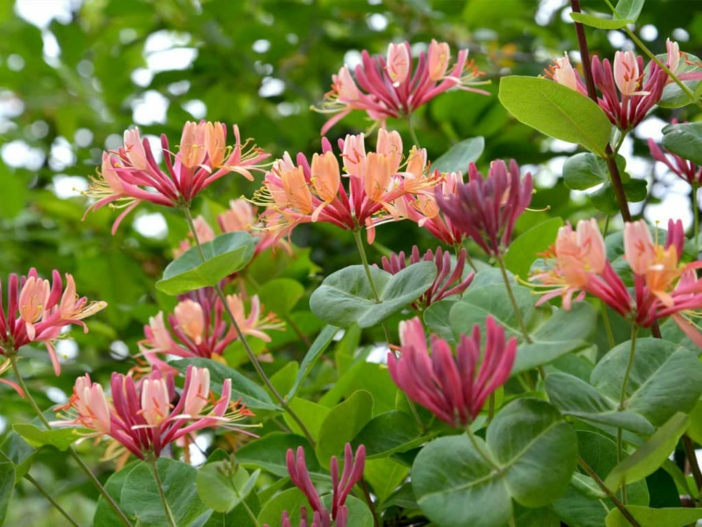 It is a woody shrub vine which climbs without clinging roots, tendrils, or thorns. Its stem goes into a crack in the bark of fibrous barked trees (such as bald cypress). The stem flattens and grows up the tree underneath the host tree’s outer bark. The fetterbush then sends out branches that emerge near the top of the tree. One odd group of climbing plants is the fern genus Lygodium, called “Climbing Ferns”. The stem does not climb, but rather the fronds (leaves) do. The fronds unroll from the tip, and theoretically never stop growing; they can form thickets as they unroll over other plants, rock faces, and fences.